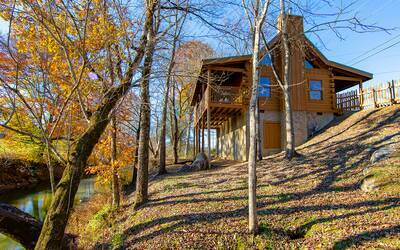 Welcome to Barefoot by the River in the Smoky Mountains! 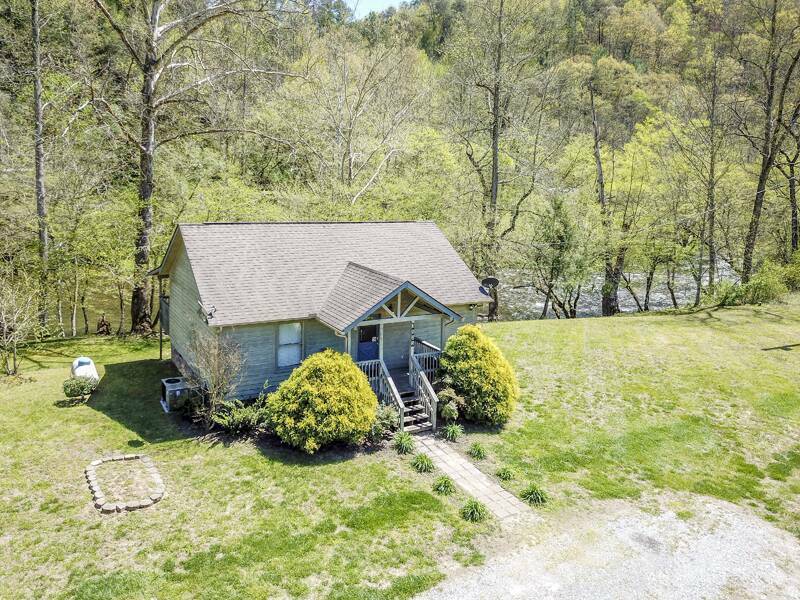 This breathtaking 1 bedroom, 1 bath riverfront cabin rental is one of the most amazing places to spend your time in the Smokies! 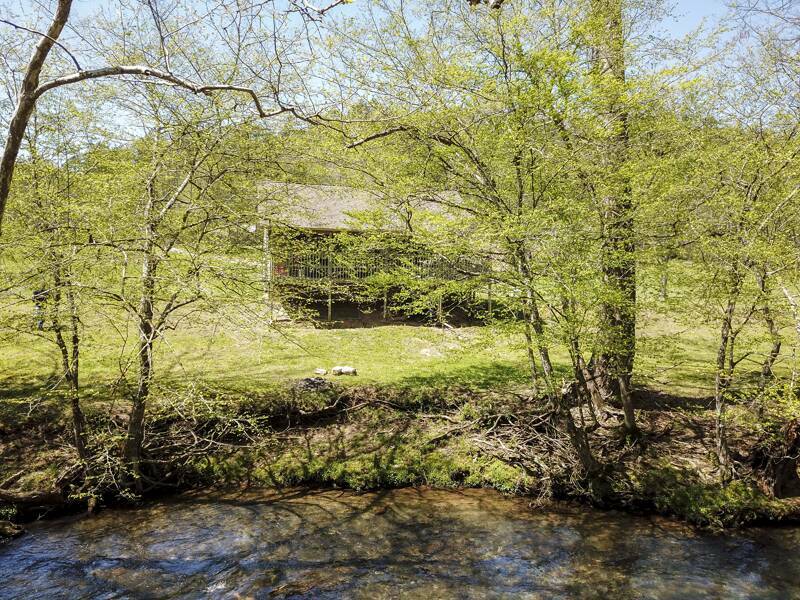 Driving up to Barefoot by the River, you are greeted by a beautiful cabin sitting mere steps away from the crystal clear waters of the Little Pigeon River. Wildlife abounds and many guests have had the opportunity to see deer, turkey and the occasional black bear. Upon entering Barefoot by the River, you are immediately welcomed by the beautiful natural wood interior. 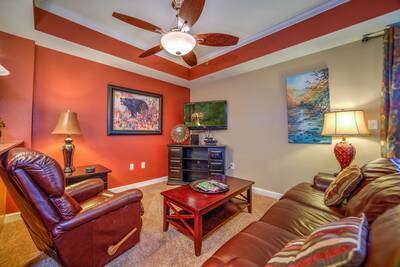 The bright, airy, open floor plan ensures that you will enjoy the company of your companion while staying here. The spacious living room features a beautiful stone accented fireplace, comfy furnishings and a large flat screen TV - great for watching a movie, sporting event or favorite television show. 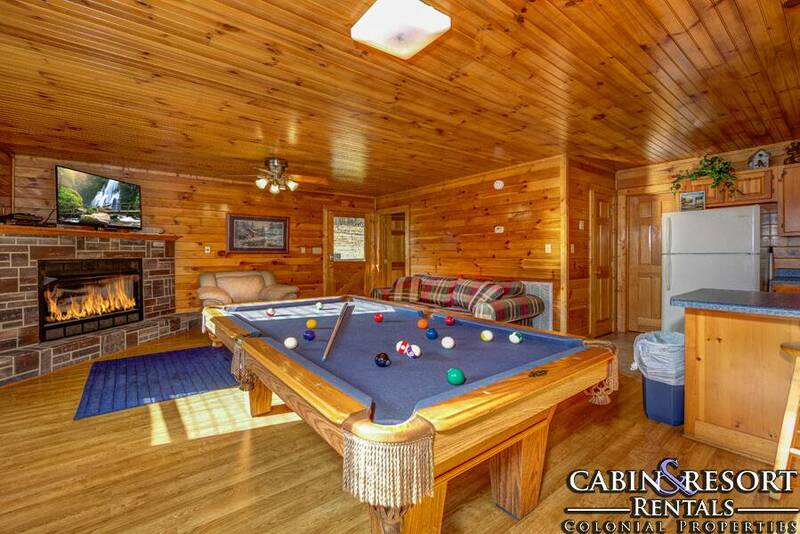 Nearby is the pool table. Challenge each other to a fun game and spend many hours laughing, giggling and determining who the real champion is. 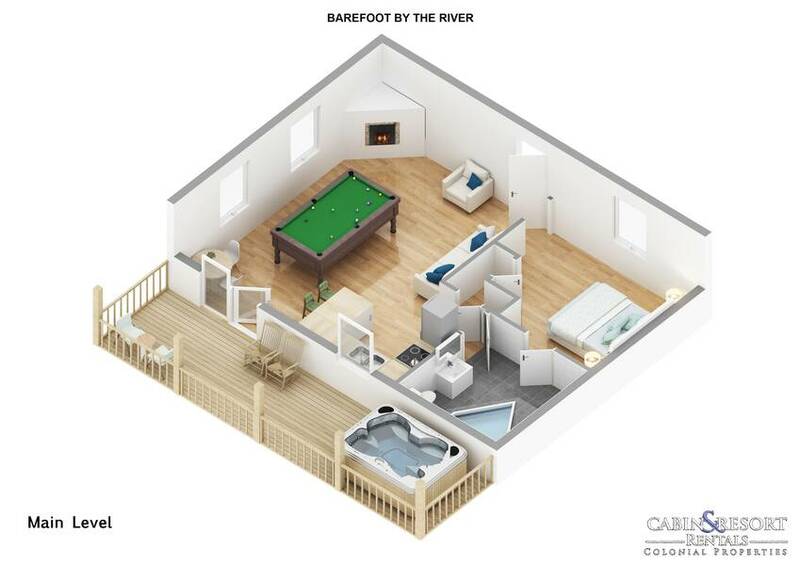 Barefoot by the River also features a fully equipped kitchen, offering everything you'll need to prepare a romantic candlelight riverside dinner, delicious lunch or yummy breakfast. When it's time to call it a day, head into the super cozy master suite. 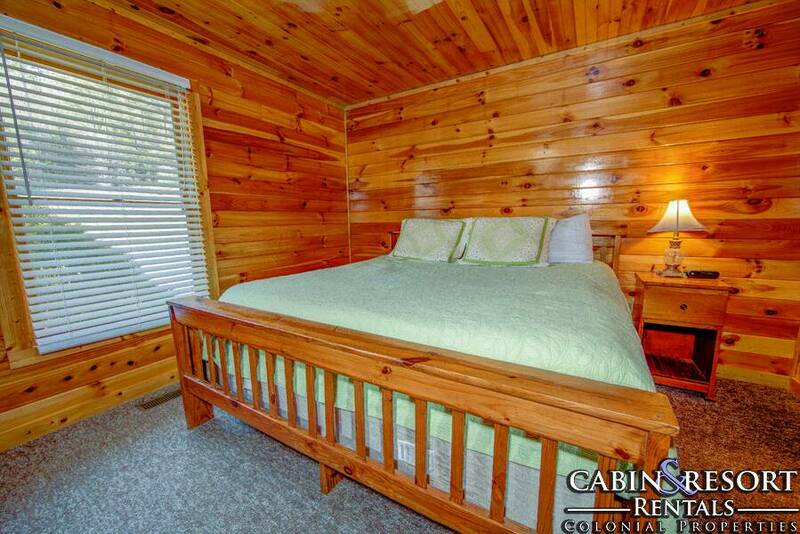 Here you will find a comfortable king size bed, flat screen TV and relaxing wood accents. 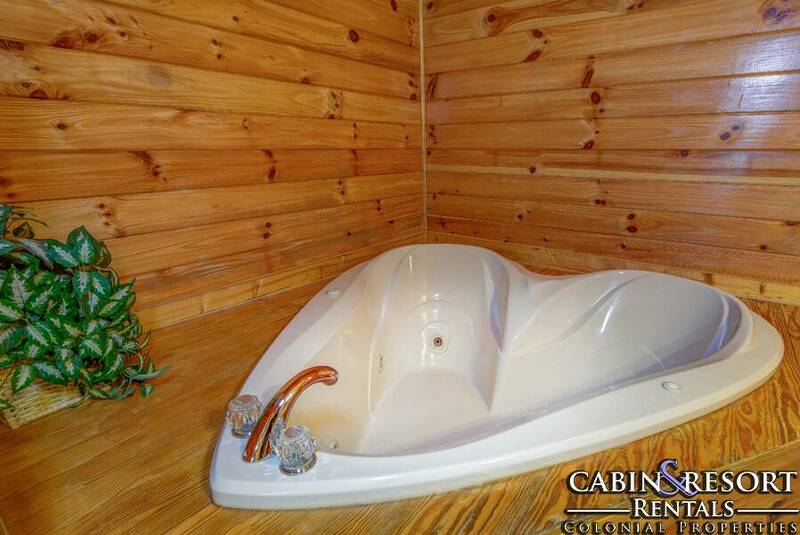 Located just off of the master suite is the ultra-luxurious full bath, complete with vanity, shower and the super romantic 2 person heart shaped jetted tub. 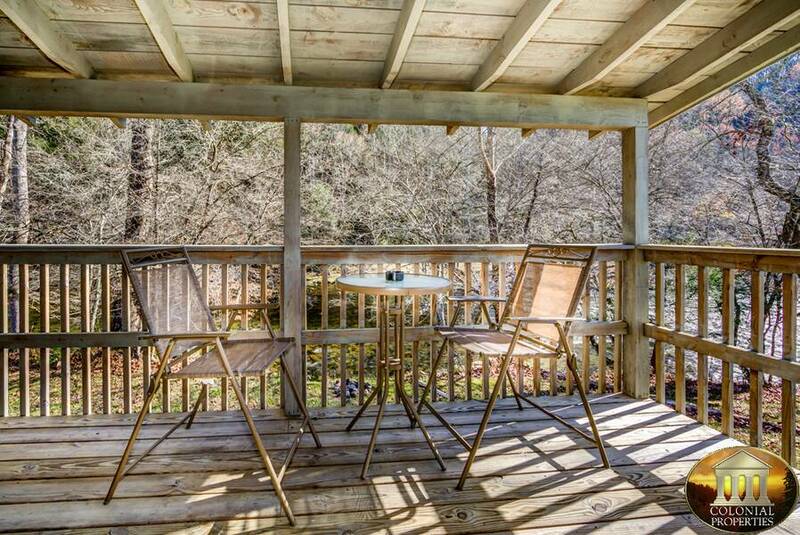 Take a step outside onto the full length covered deck to experience what life in the Smoky Mountains is all about. 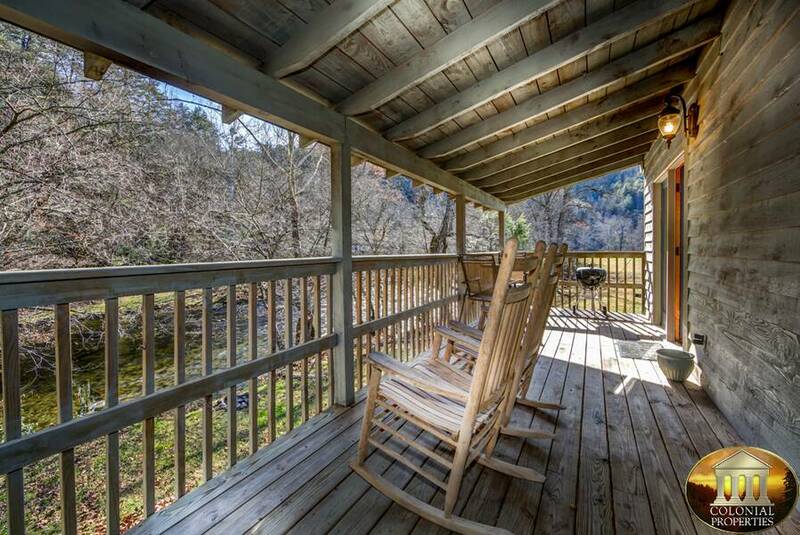 Grab a rocking chair and listen to the peaceful sounds of the river as it flows just a few feet below the deck in front of you. 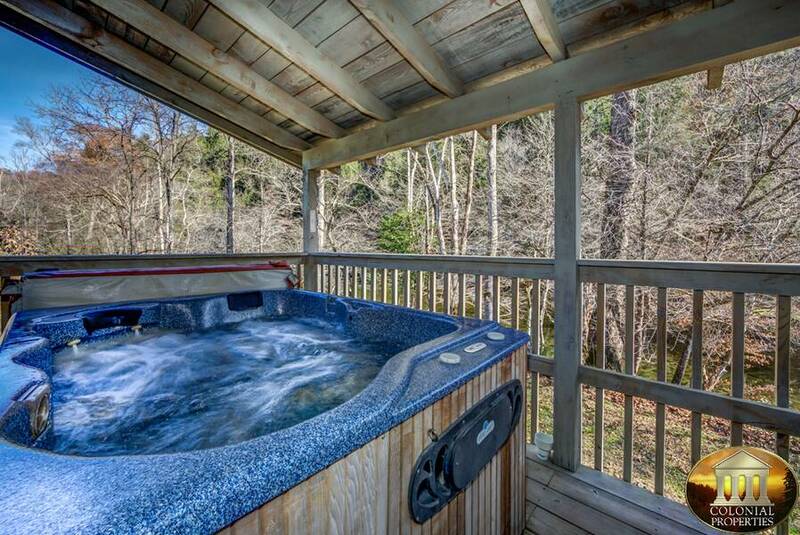 Jump into the steamy, bubbling riverside outdoor hot tub for a truly remarkable and rejuvenating experience. 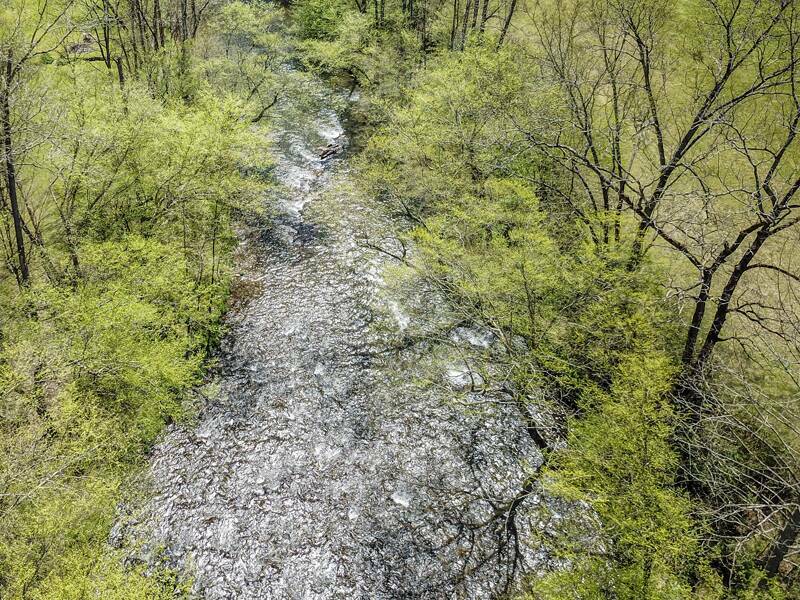 In the warmer weather, be sure to bring your bathing suit, fishing pole, raft or kayak and enjoy splashing around in crystal clear waters that flow directly from the National Park. 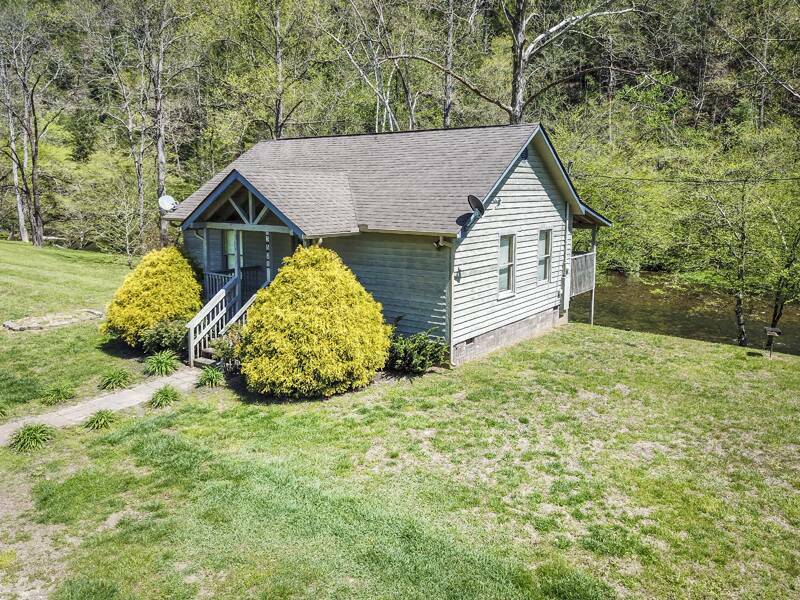 With countless amenities and one of the most tranquil settings anywhere in the Smoky Mountains, your time spent at Barefoot by the River will surely be something you'll never forget. 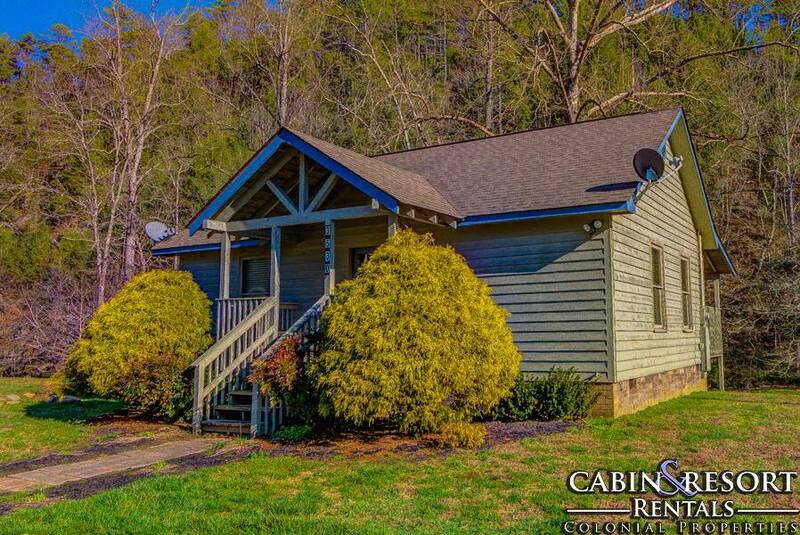 You'll also have convenient, back road entrances (away from the traffic) to both Gatlinburg and Pigeon Forge. Pack your bags, grab the love of your life and head to Barefoot by the River today! A: Hi Sudie, yes Service Dogs are welcome. A: Hi Travis! Firewood is not provided. You can purchase at local grocery stores or convenient stores in the area. A: Hi David! 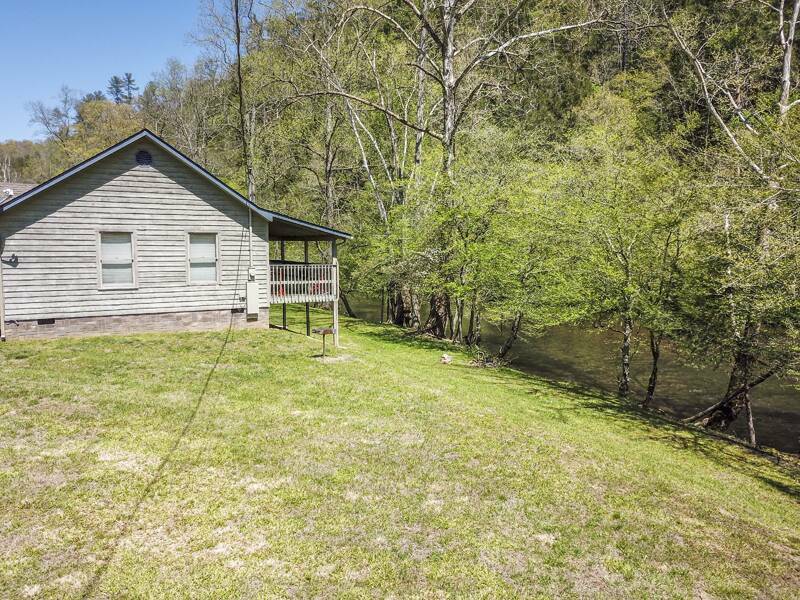 Barefoot By The River only has an occupancy of 4 people. A: Hi Tony! Yes it is. “ Beautiful, clean resort. Will be back with more family. The river is so peaceful. “ Our stay at " Barefoot By The River" was nothing but wonderful. 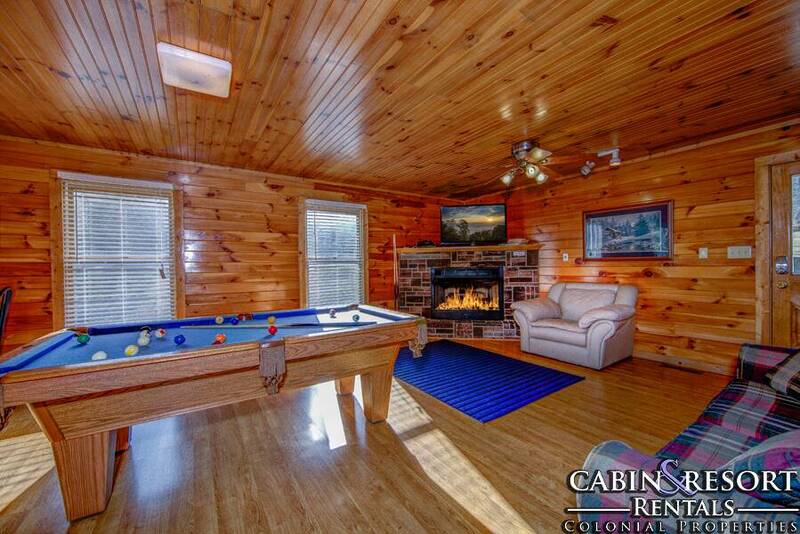 The cabin was top notch. The area beautiful. So much fun playing in the river. We didnt want to leave and cant wait to return. 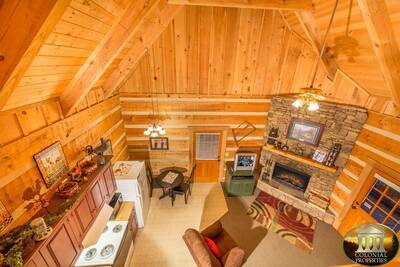 “ Beautiful little cabin for two. Nice clean cabin with a lot to offer. One of my favorite things to do was have my coffee near the river every morning. The view of the night sky was breathtaking. We will be back for sure! “ The folks at Colonial were first class . 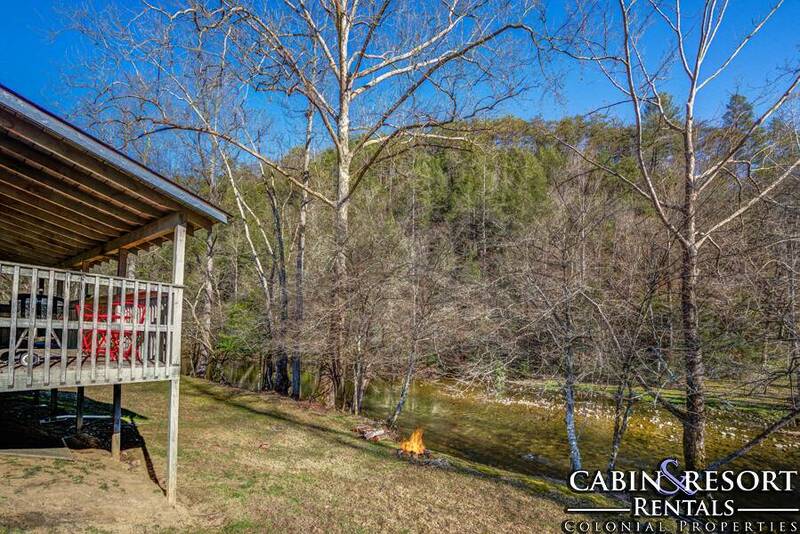 The cabin was exceptional and the River and hills were spectacular. My wife and I really needed to decompress. This was the perfect prescription. We will certainly be. Repeat customer. Thank you for a wonderful Stay. 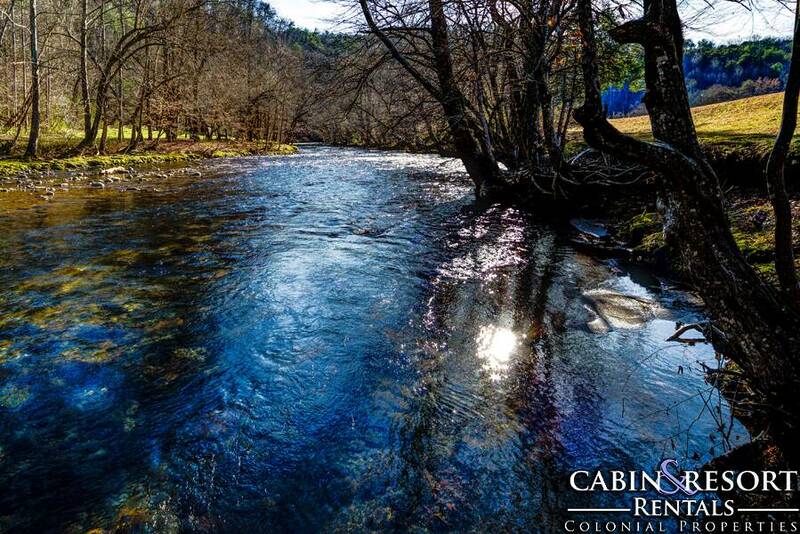 “ We have stayed with Colonial Properties numerous times over the past few years. We have NEVER been disappointed. This time was no different. Barefoot by the River has become our favorite for just the 2 of us. Words cannot describe the serenity and the peacefulness of sitting on the back deck and listening to the river flow. We rarely turned the jets on the hot tub so that we could hear the river. 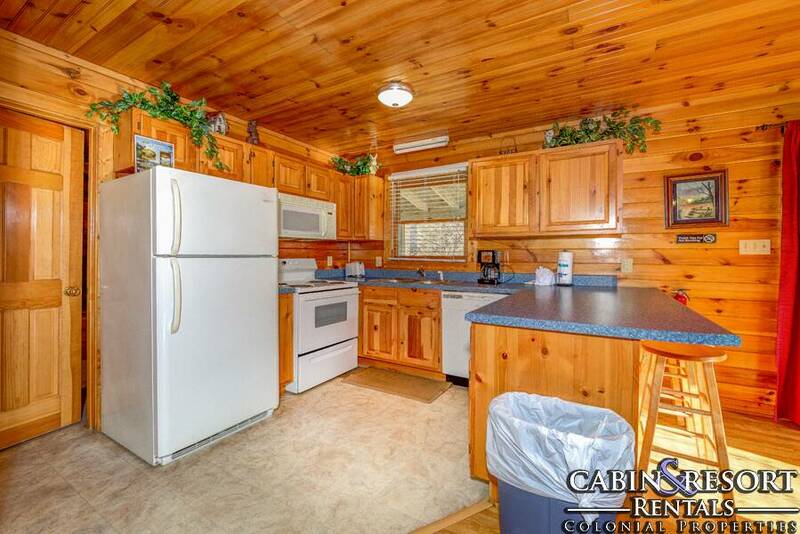 As always, the cabin was very clean and well kept. 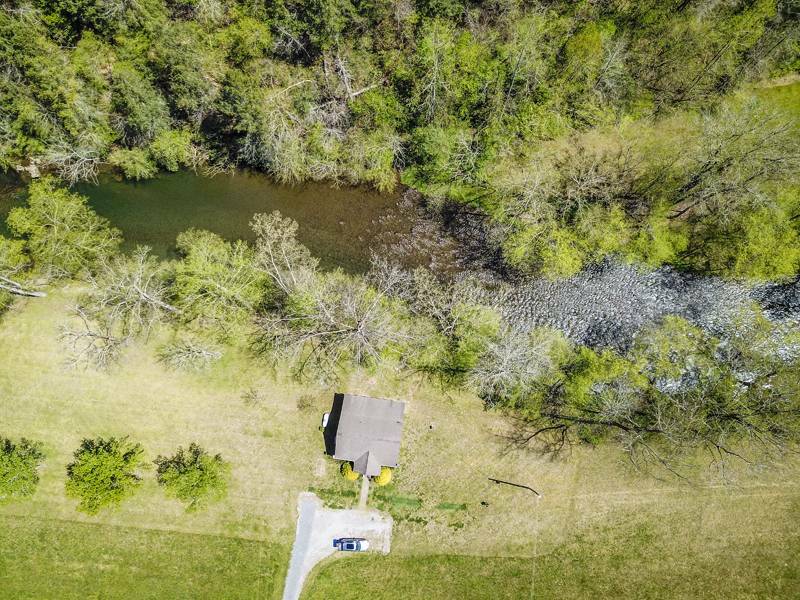 It sits to itself and is away from all the hustle and bustle; yet, if you learn your way around (as we have), it is very easy and a quick to drive back in to town. 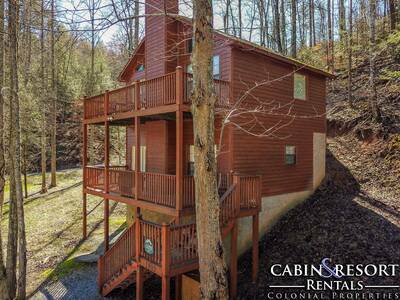 If you are looking for a romantic getaway, this cabin is definitely the place. If you have never stayed with Colonial Properties, you will not be disappointed and once you have stayed in one of their rentals, you will not want to stay any where else. The folks go out of their way to make you feel welcome and comfortable. 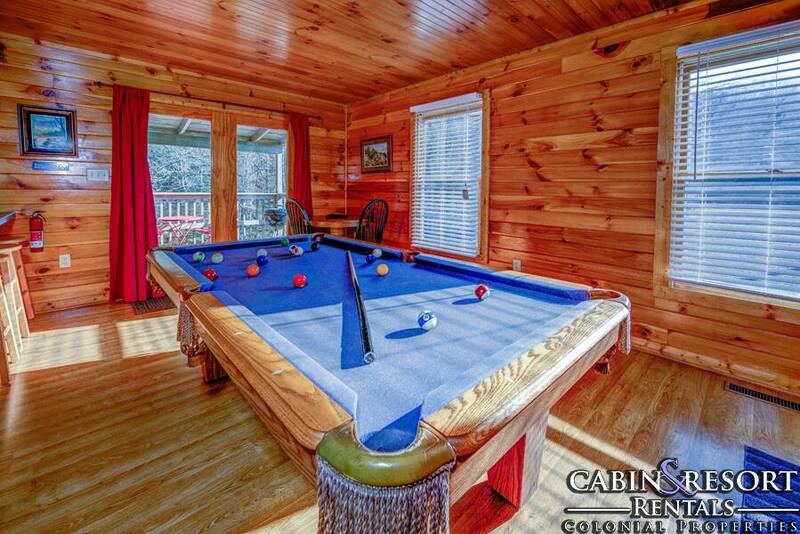 They must have the best housekeeping staff because the cabins are always well maintained. Thanks to Colonial and especially to the owner for sharing Barefoot by the River with us. 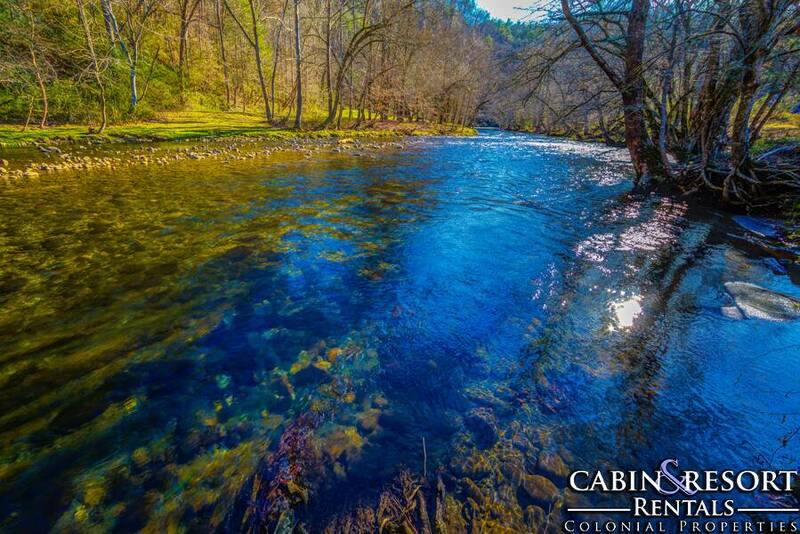 It is just another little bit of "heaven" that the Smoky Mts is known for. Thanks!!! 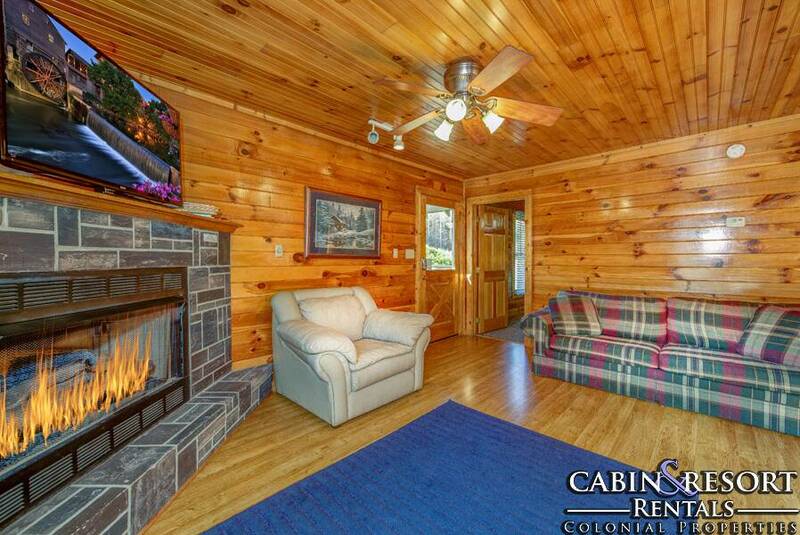 “ Pictures do not do justice for this cabin. Our breathe was taken away as we drove down to the cabin and opened the door. 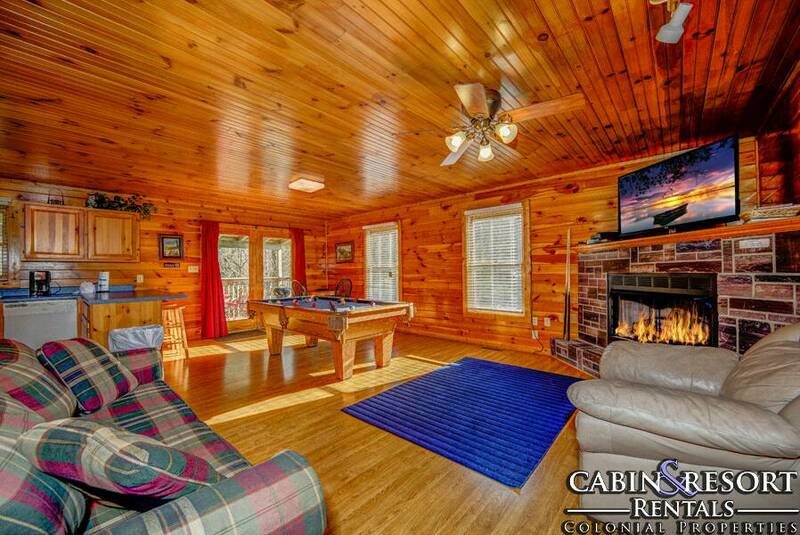 The cabin was so clean and well taken care of. 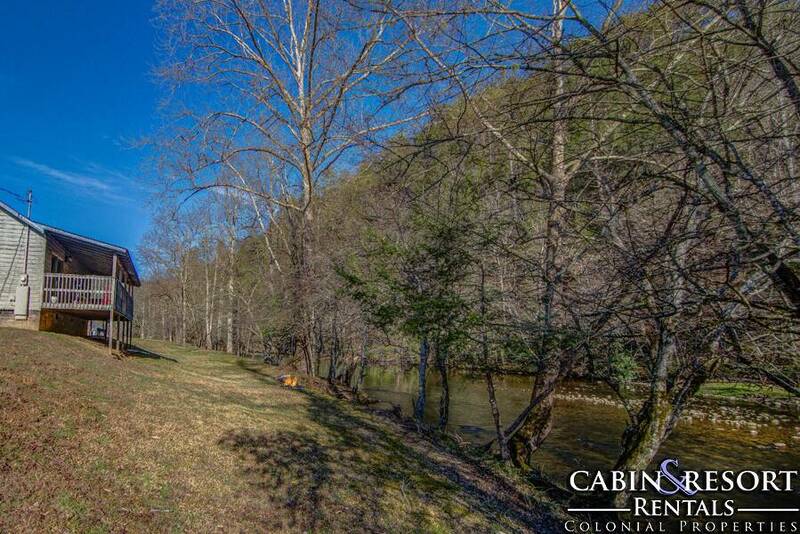 We will be returning to the Smokies soon and booking our next cabin through Colonial Properties. Thank you for an amazing vacation. “ We will be coming back next year. We loved it because it was secluded. Hot tub was really great and the water temp was perfect!!! “ We live in Ohio and knew we wanted to go to Tennessee for our honeymoon. Our only requirement for our stay somewhere was to have a river or lake nearby so we could do a lot of fishing. 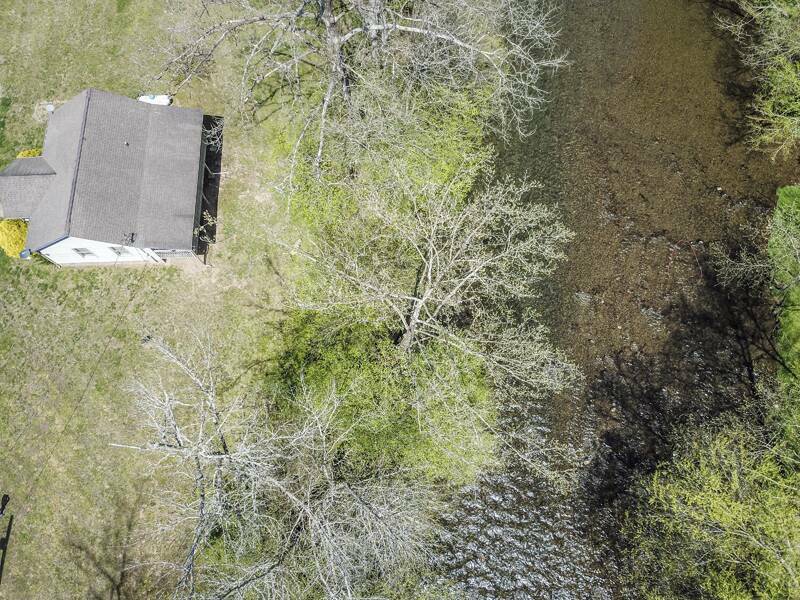 We we're so excited when we found a cabin literally on a river. The pictures looked amazing and so was the price. When we arrived we couldn't have imagined even with the pictures and all how perfect it was. Everything we needed was already there. Linens. All kitchen and bathroom supplies. A charcoal grill. Hot tub. 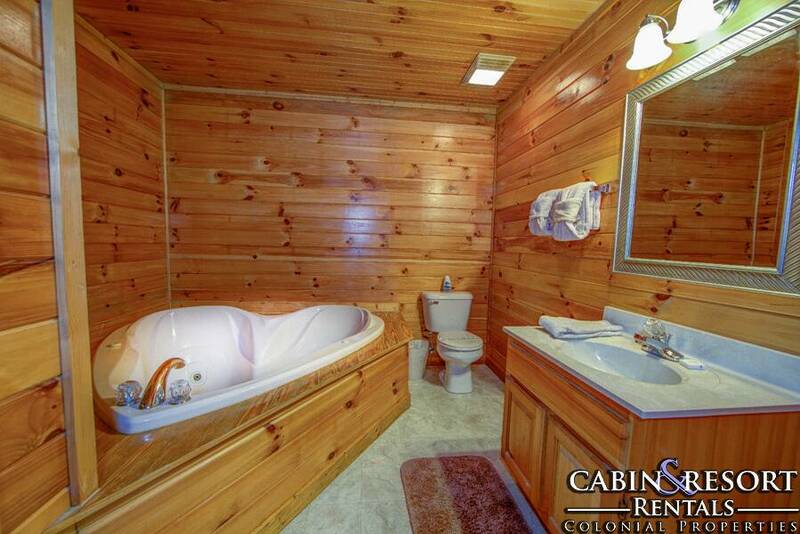 Heart shaped tub in the bathroom was super adorable. So private and relaxing. Towels shaped into swans on the bed. The details to the cabin were wonderful. 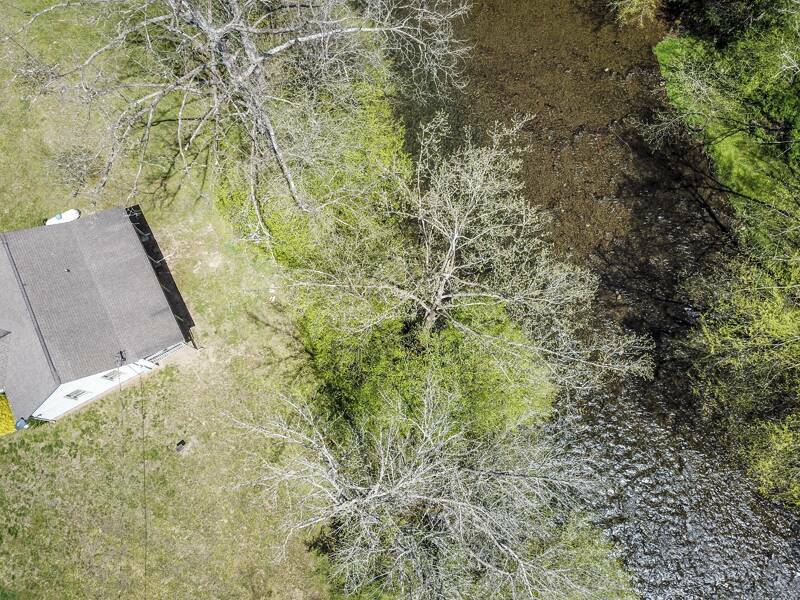 Though it was a 2 person cabin there was so much room and so much land. 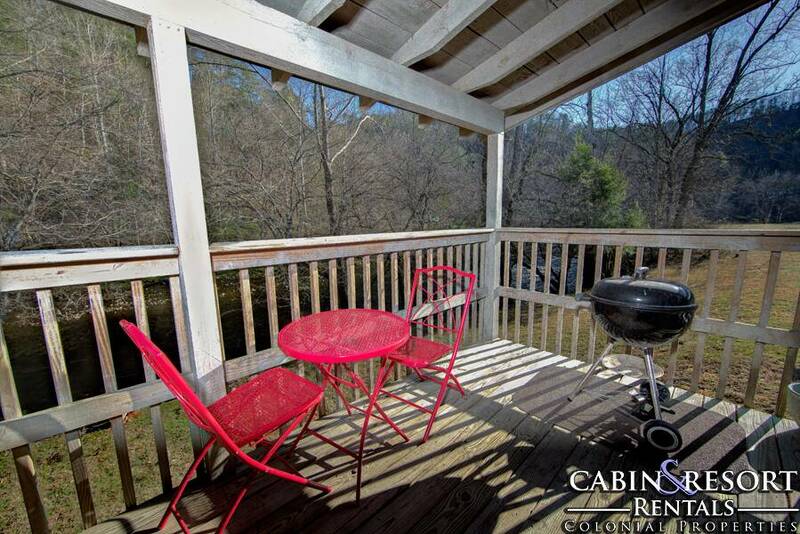 We will not be booking anymore stays with any other cabin rentals again because we have found our temporary homes away from home. I highly recommend Colonial Properties. 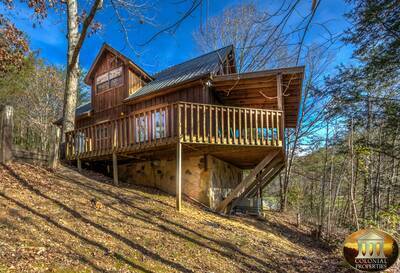 “ We fell in love with this cabin! It was everything we were looking for in our stay. 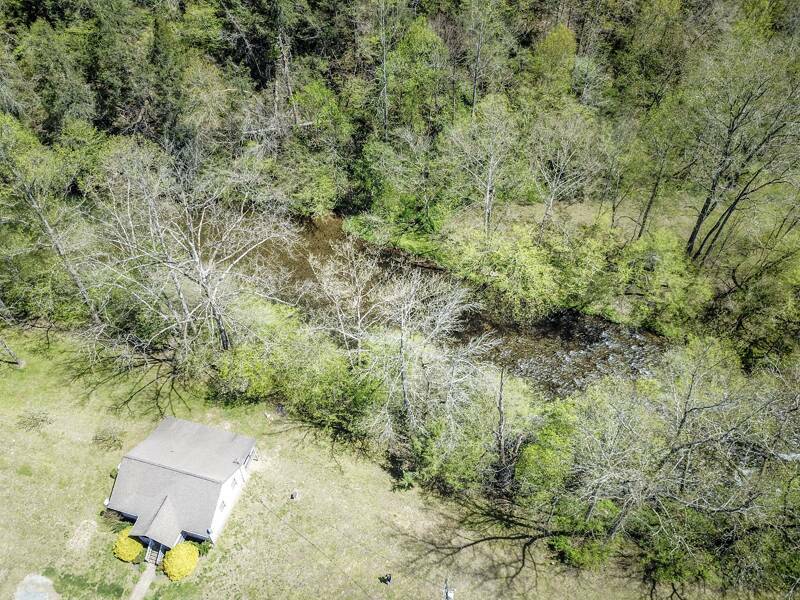 It is secluded, located right on the Little Pigeon River, and surrounded by beautiful landscapes and wildlife. Each morning from the front porch, we watched a doe and her fawn play and each evening we watched the fire flies light up the dark sky. It was such a peaceful and relaxing getaway! 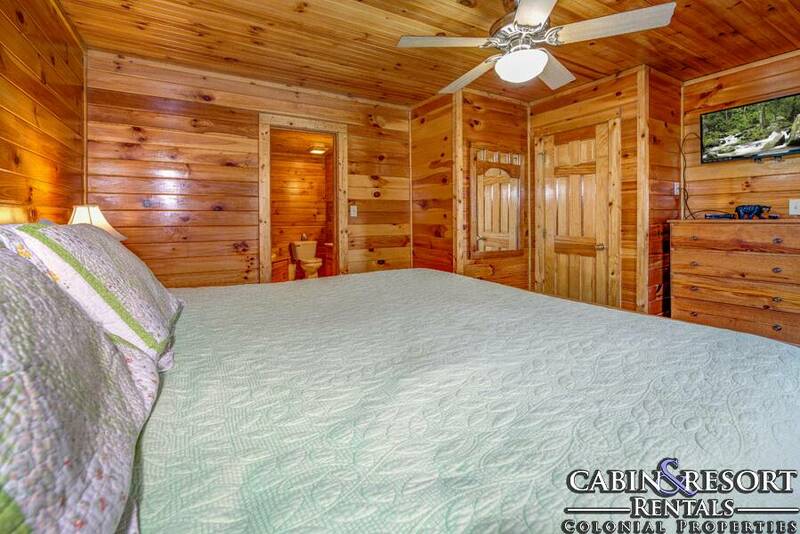 The cabin was extremely clean and very well cared for. It was fully furnished and very comfortable. 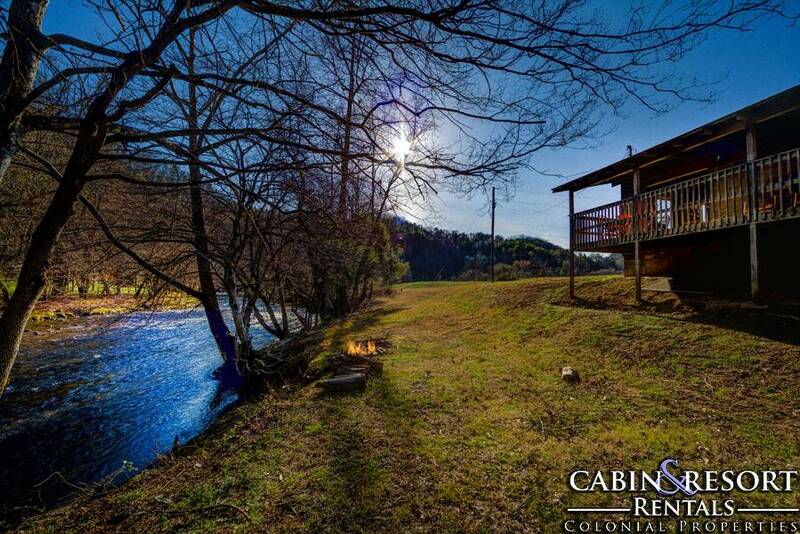 I highly recommend this cabin to anyone looking for a peaceful, secluded getaway. 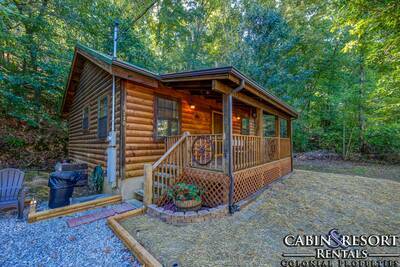 “ Wonderful cabin with a quiet and peaceful atmosphere! We would love to come back !!! The sound of the river while having a bonfire was amazing! Thanks for the great experience!